The thing about personal finance is that your finances are personal. Some personal financial advice is probably universally true for long-term financial health (ex: spend less than you earn), while other advice might not be applicable to your specific situation. You might be tempted to crack open the latest personal finance best seller, hoping to find the equivalent of a magic pill for your finances. Go ahead and read the book, but proceed with caution. Financial gurus can be great sources of inspiration and knowledge, but their advice is painted with a broad brush stroke. The advice they give will help most of their audience. But it may not help you. In fact, the advice could be detrimental to you if you aren’t thinking things through. It’s hard to tell you when to ignore traditional financial advice without falling into the same trap as the financial gurus. Instead of giving specific advice, consider these 6 times you might want to ignore traditional financial advice. See if any of the scenarios could apply to you. Most popular financial experts advise beginners to immediately save up an emergency fund of $1,000. It’s a great plan, because without a buffer, you’re likely to get caught in a cycle of debt. At some point, an expense you didn’t plan for will pop up, and you’ll have to rely on some sort of credit to bridge the gap. You might enter a vicious cycle if you don’t have enough money to make the payments on the credit. But $1,000 isn’t much to avert total financial disaster. That’s why the advice usually turns to saving up 3-6 months of living expenses as soon as you’re able. The reasoning is sound: if you lose your job, you’ll have 3-6 months of funds to rely on while you look for work. As long as you can find employment fairly quickly, you won’t lose your house, your car won’t be repossessed, and you won’t be eating Ramen noodles for breakfast, lunch, and dinner. 3-6 months of living expenses isn’t a magic number. The number could be 7-9 or it could be 1-2. 3-6 months is an attainable number that provides a sufficient buffer during decent economic times. However, you might need more. Do you hold a highly specialized degree? If so, your job search is likely to last longer than 6 months. Or perhaps you work in a one-industry town, which would dry up and blow away if the industry fell on hard times. You might be able to find work, but you might have to move to do it. On the other hand, how are you calculating your 3-6 months of expenses? Are you looking at the bottom line of your monthly budget and multiplying it? If a significant portion of your monthly budget goes toward student loans, you should assess what this number looks like without the loan payments. After all, if you lose your job or have other financial hardships, you might qualify for a deferment or forbearance. Traditional financial advice says that you should get out of debt before moving to purchasing a house or investing. This is tricky. The advice wants you to clear your debt because it basically assumes that the interest rate on your debt is higher than the interest your money could earn in the markets. That’s probably true if your debt is credit card debt, which has a high interest rate. However, if you have low interest rate debt, such as a student loan, you’re in a different situation. So if you have $100 a month and your choice is to put it toward your student loans with 3% interest rates or invest it, you might be better off investing it over the long run. Of course, this isn’t an “either-or” choice; you could choose to split your extra money between debt payoff and investing. Some gurus say that we should all have credit cards. Some say you should avoid credit cards at all costs. The truth is that it might depend on your age, goals, and credit history. If you are 22 years old with no credit history and dreams of owning a home one day, you might need a credit card. Unless you’re going to buy your house without a mortgage, you’re going to need to build credit. The quickest way to build credit is to get a credit card and use it responsibly. On the other hand, if you’re 52 years old, then your story might be different. Do you already own your home? Do you have a significant credit history? Do you have an emergency fund? If the answers are yes, then you might not need a credit card at all anymore. That still doesn’t mean you have to shred them, though you should consider that if you haven’t been using them responsibly. You put money in your 401(k) in order to retire. By borrowing or withdrawing money from it, you shoot yourself in the foot a couple of times. First, you’ll likely pay a penalty for early withdrawal. Second, you’re shortchanging your earnings growth by decreasing your funds, thereby earning less interest. Also note that you have to pay the loan back in full if you cease to work for your employer, so it can be a risky move if you aren’t confident in your employment status. Despite the long-term earnings loss, there are times where a 401(k) loan might make personal sense. For example, if you need cash quickly, but are confident in your job and the ability to pay back a loan, a 401(k) loan will probably be your lowest cost option. Another good reason might be the purchase of a home. For example, if you move for a job and leave your house on the market, you might not have the funds necessary to buy a new home. You’ve got a stable job, a good income, and possibly a family who would like to settle into their new area. You could wait and rent, or you could borrow from your 401(k), paying it back when your first home sells. Homes are property and property has typically been a solid investment. So if you’re young, older friends and family are probably encouraging you to buy a house because it’s a good investment. But not so fast. If you don’t plan to be in the home for more than a couple of years, it’s actually a pretty good bet that you’ll lose money when you sell it. As part of the sale, you’ll have to pay commissions to Realtors as well as closing fees and repairs from the home inspection. If you haven’t held onto the property for long enough, then you won’t have enough equity to cover these things. You might even find yourself having to bring money to closing! Paying to sell an investment is not a good thing. On the other hand, if you’re buying a home that is certain to fit your family’s needs in 5, 10, and 15 years, you might have a good investment on your hands. Education is certainly valuable. In a 2013 study by the National Center for Education Statistics, the average income for a college graduate was found to be over $48,000, compared to an average of $30,000 for high school graduates. It’s for this reason that traditional financial advice steers people toward higher education. In fact, some advisors remind us that we need to be saving for our children’s education, too. However, if you borrow too much money for a degree that doesn’t pay well, you haven’t set yourself up for financial success. An MIT engineer is going to have many of the same opportunities as a top-performing engineer at a public university. If you’re borrowing money for the degree, it’s not financially justifiable to go to the more expensive university. There’s nothing wrong with investing in your future by obtaining more education. The trick is to make sure that your investment doesn’t set you back in the long run. Perhaps you’re someone who tries hard to ignore the herd mentality. Just because everyone else jumps off a cliff doesn’t mean you’re preparing to take your own running leap. That’s a good thing. Be your own person and think for yourself. 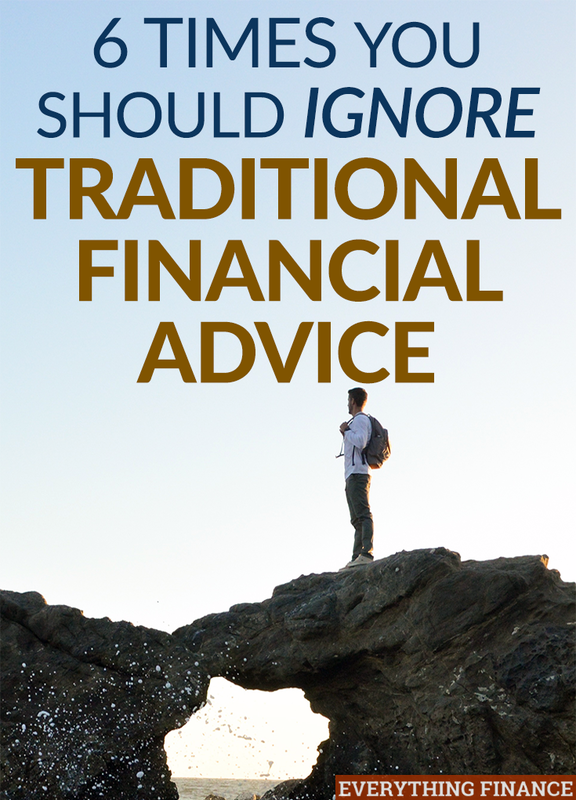 On the other hand, there’s no reason to ignore all traditional financial advice. Most of it is sound and works for people who apply it consistently. Save. Spend less than you earn. Have an emergency fund. Start saving early for retirement. You can’t go wrong with that advice – it’s evergreen. No one knows your finances like you do – even if you haven’t been doing a great job with them. Financial gurus are great, but they often aren’t able to address your specific set of circumstances. If you aren’t sure what path to take, consult a financial professional to help you chart your course. What traditional financial advice have you ignored? How did it turn out? What traditional finance advice do you disagree with?